The classic British author, Rumer Godden, probably had one very specific audience for this little children’s book: young girls who love the ballet. However, times have changed…why wouldn’t a boy who loves dance enjoy this equally well? While I’m no longer young, I did grow up loving the ballet with all my heart…until I found I couldn’t really dance! However, the lure of the dance lingers with me. And this book is written for all those children who are and were like that…enchanted with dance. Of course, there’s more to this children’s book than ballet… there are friendships, there are the ups and downs of young girls, a wonderful boy dancer and there’s an adorable puppy who more or less steals the show throughout. I can’t see that the book is very deep or profound. In some ways, it’s a simple drama of a young girl as she faces decisions about growing up, following her own dreams, and being true to herself. It is well written, and could easily be accessible to younger children, age 9. I think that the older kids would love it only if they really love ballet. 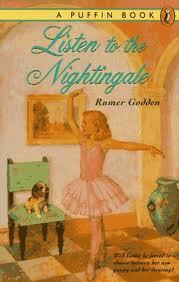 Rumer Godden is an interesting author. She has a very strong following among people I know. However, I have yet to fall in love with her books or her characters. Perhaps there’s still another one for me to find, as she wrote over 60 books before she passed away in 1998. I won’t give up just yet on her children’s books.